Autobots are the favorite food of this fearless Sharkticon. Neither Gnaw nor Sharkticons have a rich history in the pantheon of Transformers, but they are still very recognizable to most of those that grew up during the Generation 1/2 eras. Making their debut in Transformers: The Movie in 1986, the Sharkticons were little more than hungry piranha-things that ate anything and everything that was tossed into their pit. Along came Hot Rod and Kup, who managed to escape their judgment from the Quintessons, and soon the Sharkticons were battered around by the Dinobots (and shortly thereafter decided to follow Grimlock). The Sharkticons had a handful of appearances in the reminder of the Generation 1 cartoon series, but after that they faded into relative obscurity. Gnaw himself is apparently a character with a tiny smidgen of backstory, mostly as a friend to Wheelie in the Dreamwave series of Transformers comics (none of which I have read). I owned the original toy a very long time ago, and it was never one of my favorites � more like the one that was beaten up by the Autobots on a routine basis. The original toy was pretty chubby, and didn�t really do a whole lot in either robot or Sharkticon mode, though he did come with his �trademark� morning star weapon and an additional blaster rifle. Since then, Gnaw has gotten very few toy renditions. There was a major gap between 1986 and a 2010 Timelines release, and now we have the 2016/2017 release of Gnaw in the Titans Return line. 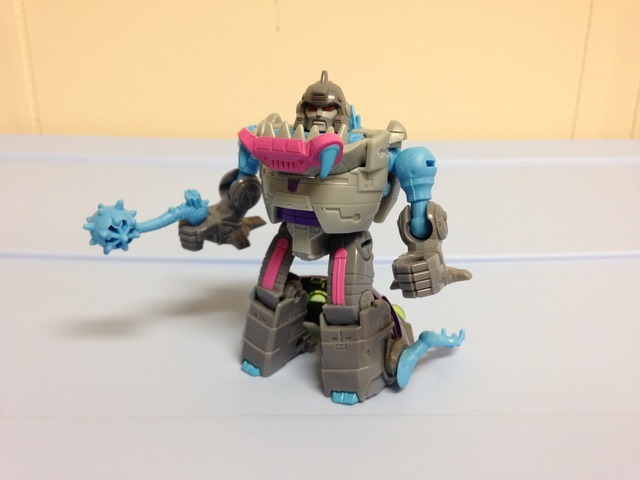 He�s still pretty chubby (apparently 30 years has taught him nothing about healthy living) but Gnaw is a very fun figure, and one that may be worthy of army building if you�ve got the cash. 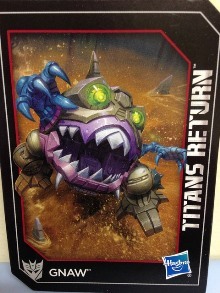 Gnaw�s alternate mode is a Sharkticon (which is a fancy way of saying �Walking Chubby Piranha-Frog�). The alternate mode is appropriately round and squatty and very closely resembles the original toy. There is added leg articulation (two ball joints) compared to the original, which gives Gnaw an added bit of stability and a tiny range of motion. On the other hand, Gnaw is so rotund that he really can�t do any dynamic poses in this mode, so the extra range is kind of a moot point. The tail is nearly the same as the original (it�s his morning star weapon) and it�s kind of stubby so it doesn�t show up well unless you see it from the side or back. The mouth is gaping open at all times, so I hope Gnaw has an endless supply of robotic saliva � it�s really quite representative of the original figure. You can open and close the mouth, which also acts as a seat (of sorts) for little Titan Masters to fit in. It�s a neat little feature, and it brings some pizzazz to the mode (but it honestly doesn�t need to, since Gnaw is really fun as is). Additionally, the arms can move around a bit; adding that to the legs and jaw, you can really do quite a bit with Gnaw in his Sharkticon mode, and I really prefer him in the alternate mode, which says quite a bit if you know my preferences for robot modes. As for coloration, the Sharkticon mode is pretty close to the original. Two shades of grey, purple, pink, and teal are on display, as well as some transparent green eyes. The mix of colors seems a little quirky, but it works well and I�m glad they didn�t change anything from the original. The previously mentioned eyes are a good touch, and they give Gnaw the same �zombie-ish� eyes that the original had, but kicked up a notch since they�re transparent. Overall, Gnaw�s Sharkticon mode is really well done and quite fun to boot. Getting Gnaw to robot mode is a simple affair, as the basic gist of the transformation is splitting the Sharkticon in half. Unlike the original toy, the top half of Gnaw�s alt mode is the legs. Remove Gnaw�s tail and swivel the teal fin out of the way. Split Gnaw at the mouth and swivel the top of the head parts in line with his feet. Open up the body to full height, and you can flip his head up and twist it around. The fin can be positioned back to its original state, and the legs can be shifted up to his shoulders and the arms flipped around at the elbow. Peg in his weapon and Gnaw is good to go. As simple and fun as the transformation is, the design leaves Gnaw with an incredibly flat back, and it�s hollow too. The back of the legs suffer a bit as well, as his head parts leave the legs really bulky but very hollow. Having the arms hang out down there doesn�t help either. 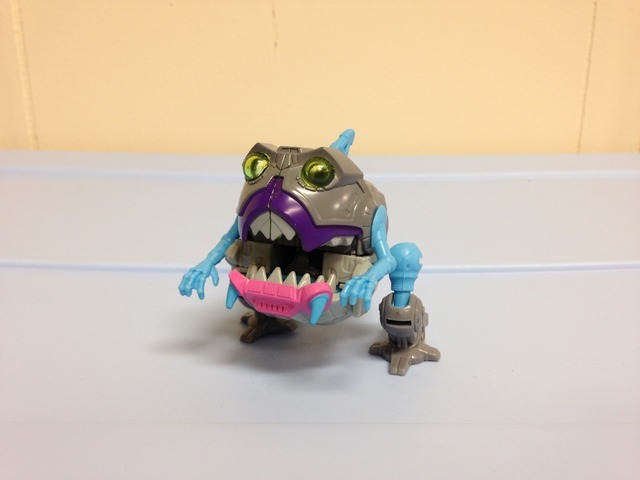 Gnaw looks really good from the front, as he�s quite barrel chested and squatty (but oddly still proportioned well). He�s shorter than most Legends figures, but it fits his design. From the front the legs issues aren�t noticeable, and the figure has a good silhouette. The head mold is done really well and quite spot on to the original. The colors are still done well here, as they were in alternate mode; this time there�s more light grey to be had, and the purple, teal, and pink accents aren�t overdone. Gnaw has a good range of motion and nothing is hindered significantly. The big back legs don�t even get in the way all that much, and the arms (double ball jointed) can practically move anywhere. The morning star is a cool weapon, though I wish a tiny blaster was included as well. Even with the lack of weapons and the obvious issues with the design, Gnaw is a pretty fun little dude in many aspects (just don�t look at his back). Transformation Design: 7. It�s nothing fancy, but incredibly fun. On the downside, the design leaves him very hollow in the back. Durability: 9. So far, Gnaw seems solid in every aspect. Fun: 10. I really, really enjoy Gnaw. He�s got one great mode and one good mode and can accommodate some Titan Master fun. The Sharkticon mode is pure joy! Aesthetics: 8. The design is very representative of the original. The Sharkticon mode is so good, it�s a shame the back of the robot came out so hollow. That said, if you�ve got him on a shelf staring straight forward, he will still look good in robot mode. Articulation: 8. For as chunky as he is, nothing is hindered and he has a good range of movement. Just don�t expect any yoga from this rotund little fellow. Value/Price: 9. Gnaw can be found pretty cheap, provided fans haven�t started army building to deplete the supply. He�s a solid figure and a lot of fun for $10 USD MSRP. Overall: 8.5. The hollowness and flat back drop this one a bit. Gnaw is a fantastically solid figure, however, and an absolute joy to play with. The Sharkticon mode is beautifully done, and he�s pretty cheap. I fully recommend adding him to your collection, as there is a ton if good qualities that he offers.